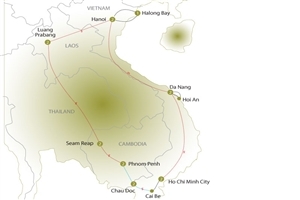 Travel through three of the most beautiful nations in Asia on this 16 day tour that begins in the bustling Vietnamese city of Hanoi before taking in ancient towns and monuments, as well as picturesque villages, as you travel through by road, water and air through Cambodia and Laos to you end destination. On arrival in Hanoi, you’ll transfer to your hotel ahead of a evening cocktail reception and welcome dinner with your tour director and fellow travellers to break the ice ahead of the start of your tour. Spend the day exploring the sights of Hanoi on a city tour, which starts out at the Mausoleum for the father of modern Vietnam, Ho Chi Minh. There is also the opportunity to visit his former home, which is located near to the stunning One Pillar Pagoda, a historic Buddhist Temple regarded as one of the most iconic in the country. A buggy ride later in the day will allow you visit the museum in the remains of the infamous Hao Lao Prison, dubbed the Hanoi Hilton by American Prisoners of War; including Senator John McCain. A traditional Vietnamese Water Puppet performance will bring the day to a close. 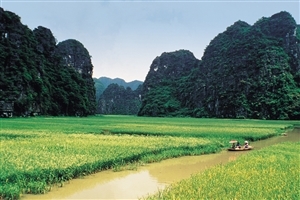 Head from Hanoi to Halong Bay by road, taking in the sights as Vietnamese life unfolds around you on the journey through the countryside. On arrival in Halong, you’ll board the Bhaya III – a wooden Junk ship combining traditional design with modern facilities – to cruise amongst the thousands of limestone islands that can be found in the bay itself. The night is spent onboard the vessel, anchored in the water. After more time spent cruising around Halong Bay, you’ll return to Hanoi before catching a flight to Da Nang, where you’ll be transferred to your overnight accommodation. Travel to Hoi An for a day exploring the ancient former trading port, which is famed for the well-preserved buildings that provide an insight into life in a bygone era. Heading out on a cyclo – a cycle-driven three-wheeled form of transport – you’ll be able to see the historic highlights of the city before a cookery lesson at the Red Bridge Cookery School, where you’ll help to prepare your own meal. The rest of the day will then be spent at leisure. 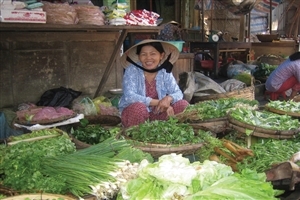 From Da Nang, you’ll board a flight to head south to Ho Chi Minh, the city formerly known as Saigon. On arrival, you’ll journey out to the famous Cu Chi Tunnels to see what life was like for the members of the Viet Cong who were based underground during the French and American wars; with the vast underground network stretching out for hundreds of miles under the Vietnamese countryside. Spend the day touring the sights around Ho Chi Minh, including Reunification Hall and the Old Saigon Post Office as well as the Notre Dame Cathedral, established in the 1800s by French colonists who were living in the city. The cathedral is now one of the most important catholic sites in Vietnam. From Saigon, you’ll journey to the town of Cai Be on the banks of the Mekong River before boarding a traditional motorized sampan to visit the town’s floating market. Having watched the local traders doing business, you’ll then get chance to see locals going about their daily business as you cruise past many of the small villages that can found alongside the water in the Mekong Delta. After a visit to a rice paper workshop, lunch will be served as a local farmers home to give further insight into local life before you continue on land to Chau Doc. Take a tour around another floating market in Chau Doc before a boat ride to see a floating fish farm and a nearby Cham village. You’ll then have time to spend alone during the afternoon and can take a trip to the pilgrimage location of Sam Mountain on your final day on Vietnamese soil. Travel into Cambodia by water with a speedboat ride along the Mekong River, seeing the world pass by as you cruise all the way to the capital city of Phnom Penh. On arrival, check in at your hotel before dinner at a city restaurant. Spend time exploring Phnom Penh with a visit to the Royal Palace complex. While there, you’ll pay a visit to the National Museum to learn more about the history of the country and to see a stunning collection of Khmer art dating back thousands of years. Another highlight comes on a visit to the official temple of the King of Cambodia, the Silver Pagoda – so called because of the 5,000 silver tiles that can be found lining the floors inside. Take a flight to Siem Reap and the gateway to the famous Angkor Temples. A guided tour of the most famous of the temples, the huge Angkor Wat complex, will provide you with your first chance to explore the area, ahead of an evening meal back at your hotel. Spend more time exploring the temples, with a visit to Angkor Thom and the impressive Bayon Temple. While there, you can also marvel at the carvings to be found at the Terrace of Elephants before spending time at leisure to explore further. Day 14: Siem Reap – Luang Prabang Start the final part of your trip with a flight from Siem Reap into Laos, arriving in the city of Luang Prabang where you’ll enjoy dinner at the popular L’Elephant restaurant. You’ll then be able to enjoy time relaxing in your luxurious accommodation at the end of the day. Your final full day will begin with the chance to witness the local monks emerging from their temples to seek alms. Having returned to your hotel for breakfast, there is the chance to visit the National Museum and the Wat Mai temple before a drive through the countryside to the stunning Kuang Si falls. A traditional Lao baci well-wishing ceremony with music and dancing will follow your farewell dinner. After a visit to the beautiful temple of Vat Xiang Thong and some free time to explore, you’ll head for the airport for your return flight home.